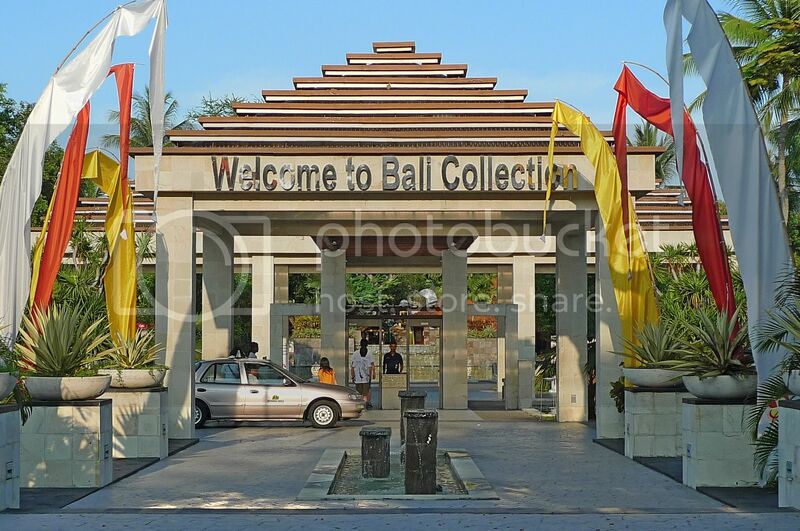 After leaving Jenggala Keramik in Jimbaran, my friend and I asked our driver to drop us at Bali Collection in Nusa Dua. By the way, we hired this driver earlier at the cost of 400,000 rupiah a day. He was a very pleasant and friendly driver and would proved to be invaluable to us for the remaining parts of our trip in Bali. Nusa Dua is a high class resort-like enclave in Bali where you can find some of the best international 5-star hotels and resorts. The place reminded me of places like Beverly Hills in USA which I saw on TV with manicured lawns, and huge expensive looking properties. 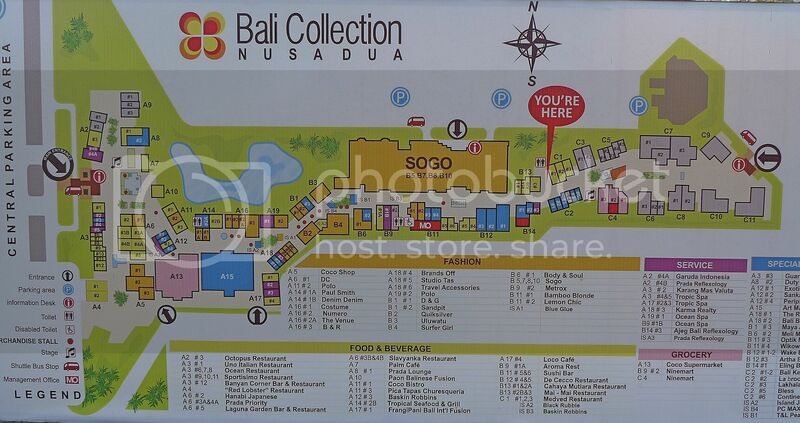 And the Bali Collection in Nusa Dua is a shopping complex with an outdoor mall feel complete with restaurants and outdoor dining. Here's the map of the place. I did not take many photos here. It was a huge place and we just did some window shopping. 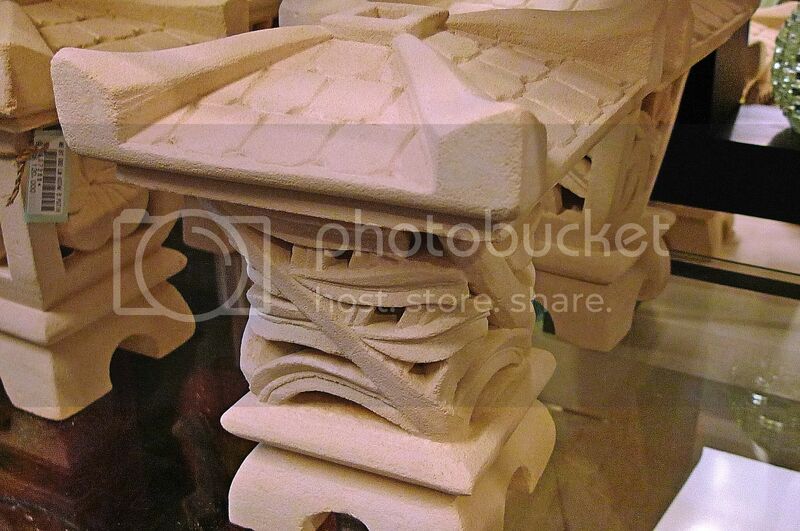 I saw these fine looking sandstone sculptures at one of the shops there. 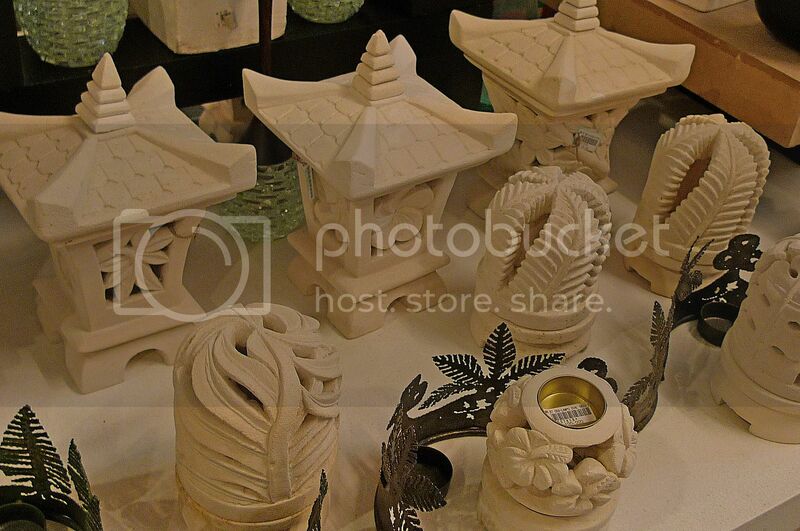 Almost thought of buying this one below because of its very skillful carvings, but decided against it. Although it costs about 100,000 rupiah (RM36), it was still much cheaper than buying this sandstone carvings in Malaysia. 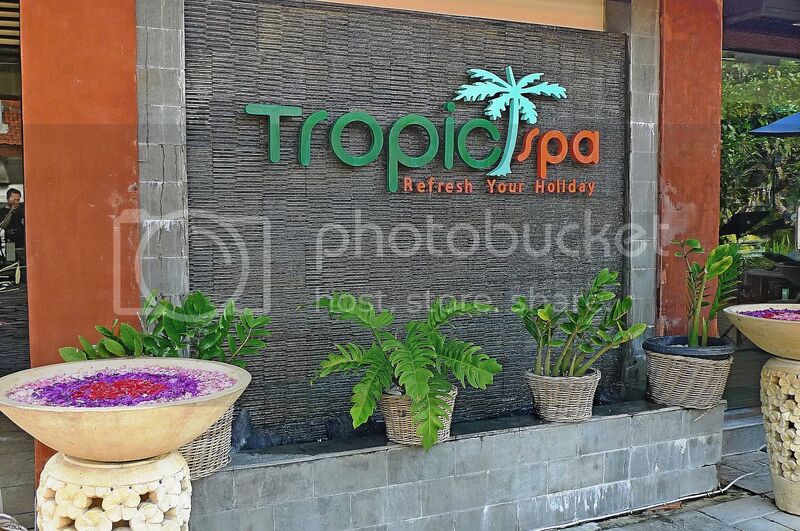 We passed by this Tropic Spa and almost wanted to go in but we decided not to. Two of our friends would be arriving at 7pm and checking in at the Mercure Hotel at Jalan Pantai Kuta (Kuta Beach) so we got our driver to drove us there. However, it was still early and since there was time to kill, we walked along the Kuta Beach road and patronised some of the shops there. 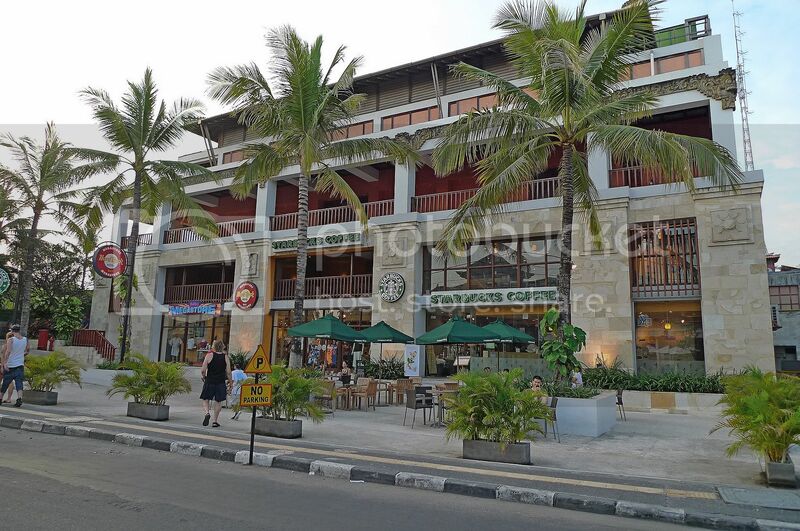 The above is a photo of Starbucks at Kuta Beach. I like the building! One of the shops had these cute hens for sale. They are for you to store your chicken eggs! 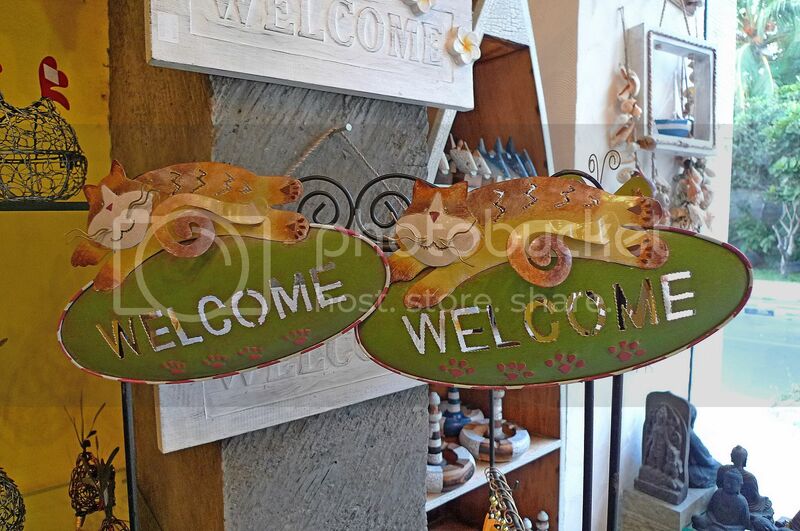 Would you like these "Welcome" signs at the front entrance of your house? Well, my friend bought the hen but I did not buy anything. I was pretty sure the hens would make quite nice souvenirs but they were a little too big for me! 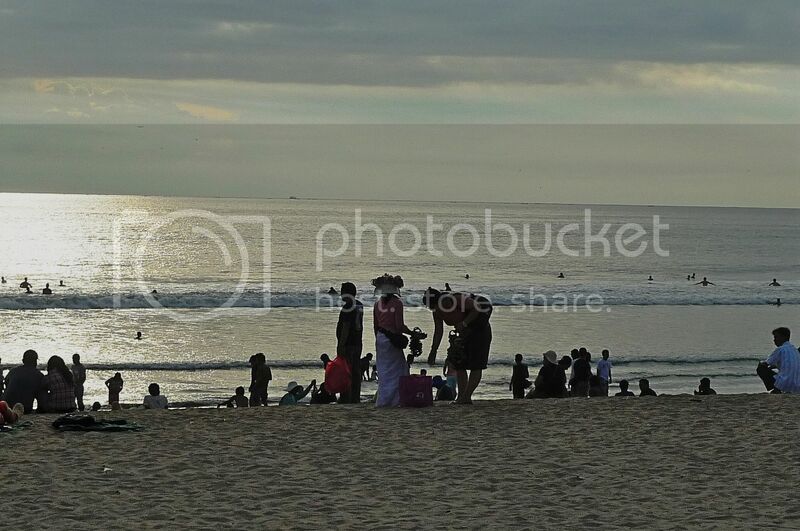 We then took a stroll along Kuta Beach, which was a popular surfers' beach. I was surprised to see more locals than tourists at this beach. The beach was just like any ordinary beach to me - nothing special or interesting about it. I guess if I really wanted to go to the beach, I would rather go for Carribean holidays. I could just imagine those Carribean islands with their white sandy beaches and crystal clear turquoise waters! Heavenly! After strolling for some time, we went over to Mercure Hotel opposite to wait for our friends. They arrived at about 7.30pm and after checking in, we got our driver to drive us to La Luciola for dinner. La Luciola is a beach-front Italian restaurant located at Jalan Raya Petitinget. Reservations is compulsory so we had earlier made our reservations. The food was nice but unfortunately I could not show any photos here as they did not turn out well due to the lack of lighting in this restaurant. Yes, it was so dark I could hardly read the menu and had to ask the waiter for a torchlight! Oh, if you really want to see a photo, here's one! It was our desserts for the night and please don't ask me what they were as I honestly could not remember! That about wraps up my first day in Bali. WHOAA d beach soooo crowded! how come got those ppl wearing in white leh? special eevnt at thr?? I wish go there again.. Bali is nice place. is that an ice cream?? Oh I remember entering that Starbucks in Kuta too! It very near the Hard Rock Hotel right? Anyway the sandstone looks HEAVY Ler! Don't think it's wise to buy something so heavy to bring back! LOL! I like the Kuta Beach! I want to go Bali, but it's hot there hor? So you were an high class tourist in Nusa Dua? And you won't have problem with the $500-room in Redang, 2012? caroline ng, why kaya? Window shopping only! Yes I think there's a special event at the beach but did not bother to check what event that was! LOL! manglish, Yes I heard all hotels were cheaper in Bali right after the bombings. iamthewitch, yes Starbucks is almost next to Hard Rock Hotel. The sandstone is not really heavy and it's actually worth buying cos it's so much more expensive here in Malaysia! cindy, it's terribly hot in Kuta and Seminyak and Denpasar. But cooler in Ubud. As for desserts, I believe the one (white) on the right is a panna cotta. I love that dessert. It's usually served with a swirl of berry sauce. Yum! not yet got the prize wor.. what is that? heheheh..
the last photo is yummy!!!! foong, eyesight not good izit have to ask for torchlight to read menu. Met any celebretites there on the beach? I would have definitely bought that sand sculpture! How was the weather in Bali? Extremely hot or comfortable hot? My parents plan on traveling to Asia this summer but they're worried that the climate in Asia has gotten too hot over the past couple of years. 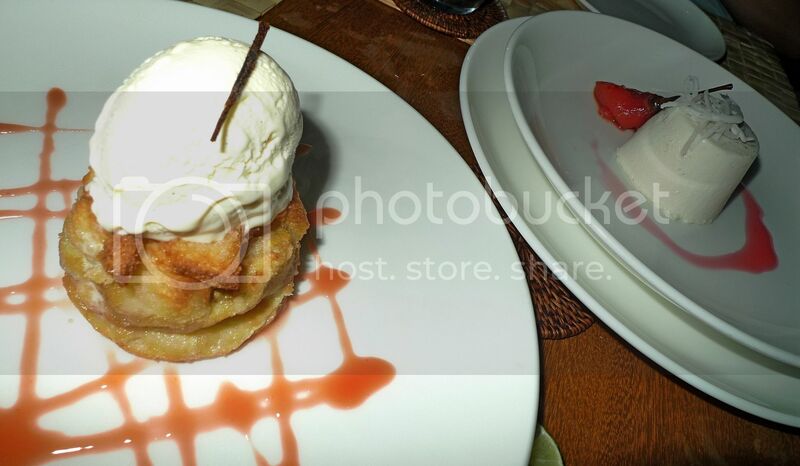 The dessert looks really yummy! The sandstone carvings maybe be cheaper than in Malaysia but add in the freight, insurance charges etc would be the same and back to square one haha. The kok kok kai looks nice are they bigger than the oink oink? mei teng, the caged hens are for putting your chicken eggs. Haha! donna, wonder why it's taking so long for the prize to reach you? Hope it's not lost in the mail. Or worse, stolen! I don't really like the beach - we have better beaches here in Malaysia actually! But Kuta Beach is popular cos you can do surfing in the waves there. kelvin, none. zero. zip. nil. rosebelle,yes the sand sculpture is really nice and I was tempted to buy too! The weather was extremely hot in Bali! But that was in Seminyak and Kuta area. It was cooler in Ubud. bananaz, not really. After adding in the freight and whatever additional charges, it would still be cheaper than buying at marked up prices in Malaysia. Yes, I think it's smart of your colleague to visit Bali right after the bombing - I also think that'a the best time to visit! Hi there, it has been a while, how you doin? Looks like you're having fun taking pictures and traveling! The Starbucks Building looks really good, I've only seen the same kind of style when I was taking a trip in one of the provinces outside Manila. And wow, there's a lot of people in that beach, do you dig beaches with a lot of people? Of course you'd rather have like only a handful of people! kuta beach... i wanna go back again... and surf again and again!!!! Wow. I am impressed with the shopping complex. 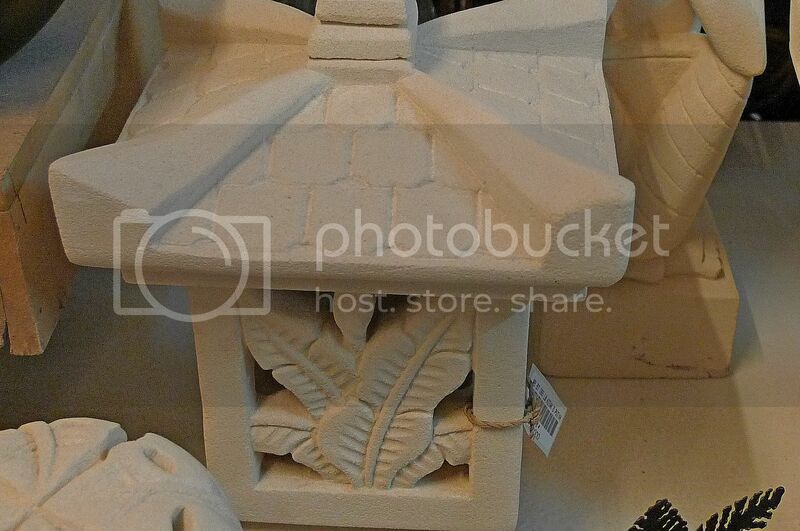 I wonder how you're going to carry the stone carving back if you do buy one?!! 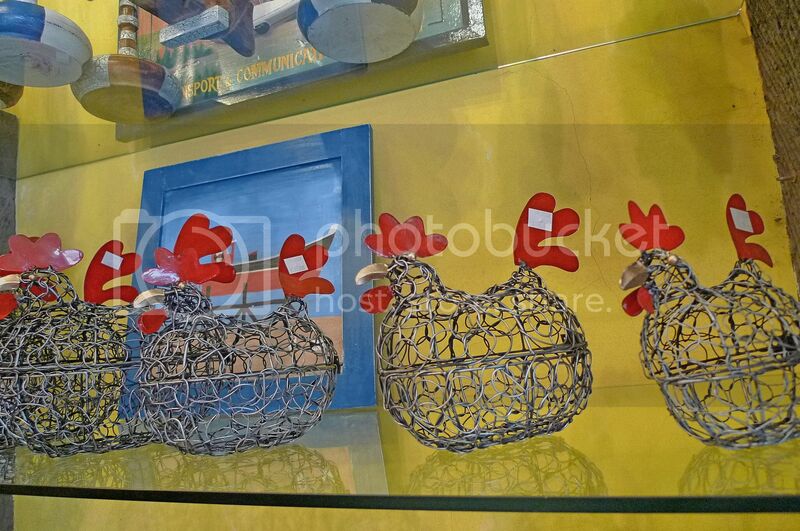 so much cute stuffs there...that hen (chicken) thing is cool! ang-moh like to visit Bali, almost like their playground. This place sure looks very peaceful. So, those indonesians don't hassle you to buy stuff from them? what a first day. a great day to feel the vibe of the place. awesome views foongpc. i love the starbucks building too! huh? how long you sent? ahahaha, maybe my company is in jungle..
hi foong just visiting you here... gheeeh thanks for visiting my other blogs!! No wonder you bought so many souvenirs home. They have really cute stuff there. I like the view of the beach. I always like beach! If I were you, I would have stay to take sunset on the beach. Your friends only arrived at 7.30 anyway. Ouh....RM1Million only RM370? War...our money very big o.
I like the beach and pretty sky. Nice and neat buildings - somehow remind me of buildings in movie studios. No? Those sandstone sculptures would look great in a garden though could be quite cumbersome to bring back, wouldn't it? I am waiting for Bali breakfast then! Not just to chop but also cause i love breakfast ha ha! Kuta Beach.. i remember that was the first time i saw surfers at sea. Bali is pretty. looking forward to ur series on bali. so you went to Bali? how fascinating. i'd love to visit this magical place someday. enjoy the rest of your weekend. Wei-wei, we are still spending the first evening in Bali? Seems like a long evening.. haha..
Nice sandstone sculptures, beautiful resort. Hens are so cute. Sea beach is amazing. 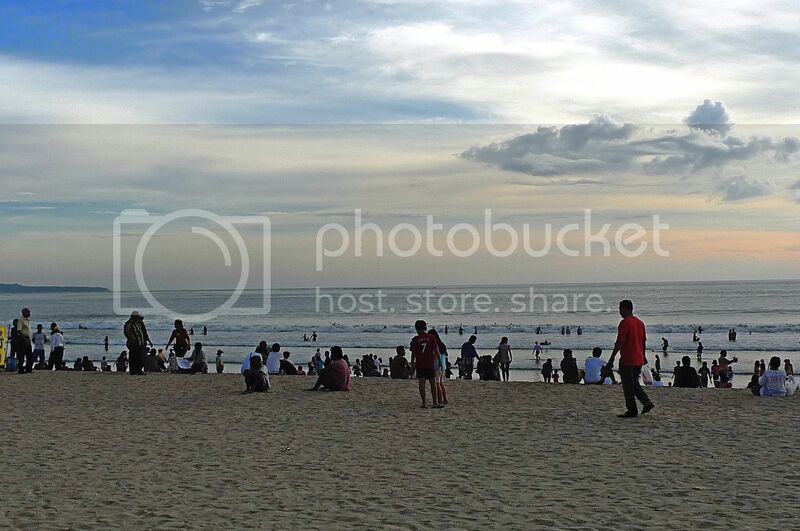 kuta beach is very famous with tourists!! we went there at night, and everywhere is foreigners, haha..
but we just went there to get some souvenirs from Hard Rock.. didn't have time to for the beach, and i remember that day it was raining whole day..
i like the hens for chicken eggs haha! 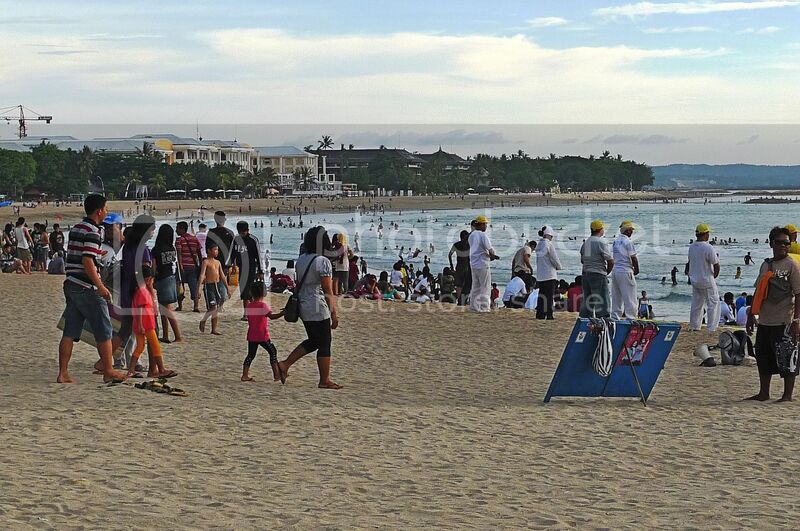 wahh so many ppl at Kuta Beach.. i prefer if it's not so crowded..
Hi very visitable post all is very nice looking and also very impressive all sharing is rarely very useful.